One of the reasons for the enduring fascination people have for the Civil War, I think, is because it was captured in photographs. One hundred and fifty years later we still have haunting portraits of soldiers and civilians from that era, gazing at us from across the gulf of years. It adds a personal dimension to the war. The photography of the 1860s had its limitations, however. Exposures needed to be long, meaning photographers couldn’t capture fast-moving subjects. The equipment was big and bulky, too, limiting its uses in the field. 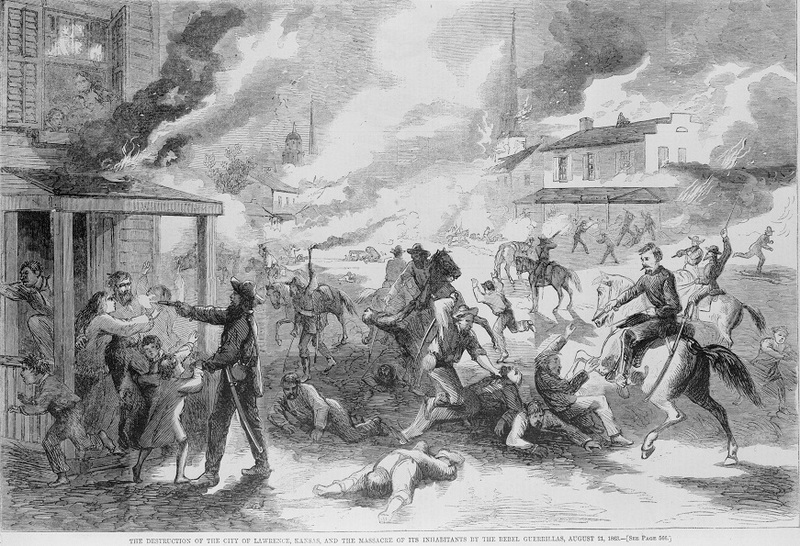 That is why Civil War photography hadn’t eliminated the need for sketch artists, those men who captured their impressions of battles and events in drawings they sent back to their publications, where engravers copied them for the printing process. Alfred Waud, photographed by Timothy O’Sullivan in 1863. One of the best sketch artists of the war was Alfred Waud. 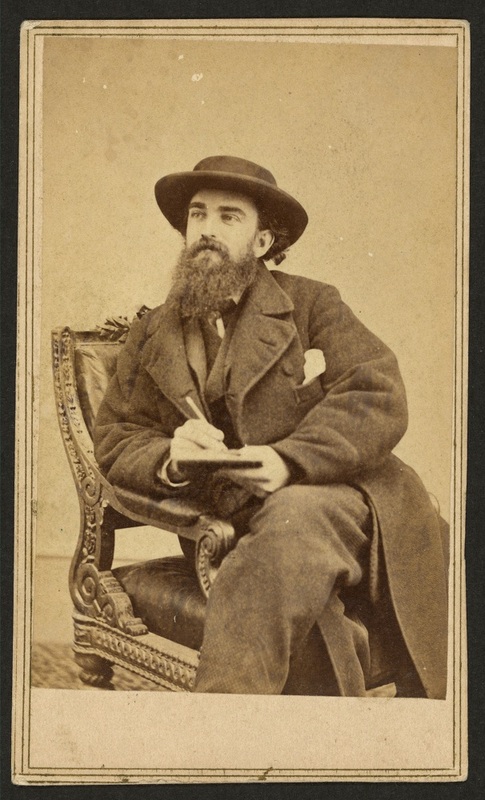 Born in England in 1828, Waud began capturing the Civil War on paper first for the New York Illustrated News in 1861 and for Harper’s Weekly later that year. Waud was at First Bull Run and remained with the Army of the Potomac through Appomattox. (David Lowe used a Ward caricature of Theodore Lyman, Meade’s always observant aide, on the cover of the book he edited of Lyman’s journals (highly recommended). Waud should have sketched the dinner that followed, which apparently turned into a drunken rout, with a friend of Pennsylvania governor Andrew Curtin standing on a table singing bawdy songs while privates hobnobbed with captains. I have no doubt that Meade excused himself before things descended to that level. The day did lead him into unwanted political controversies, though, when a newspaper reported that in his acceptance speech Meade endorsed Curtin’s reelection. He did no such thing, protested Meade, who always endeavored to avoid politics in his public life. 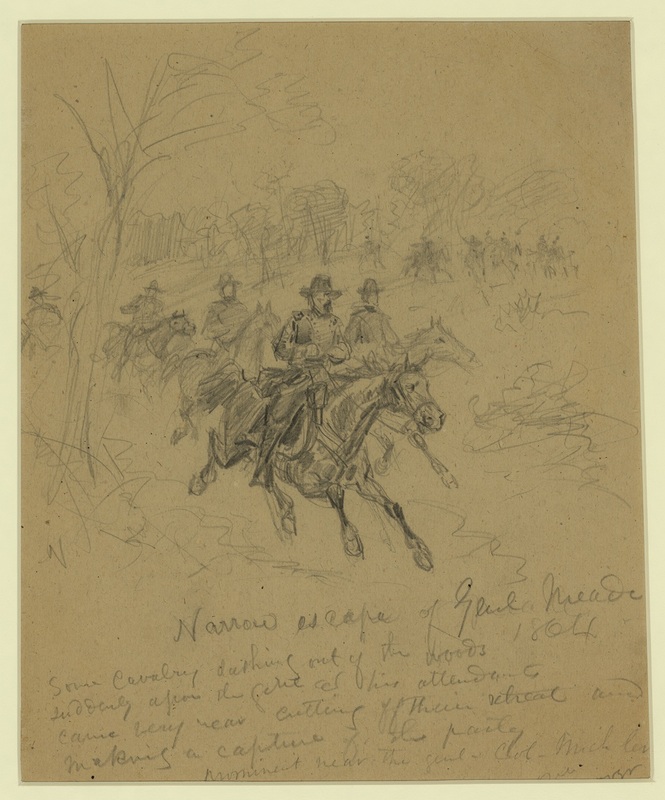 The second sketch (above) depicts the Battle of the Wilderness, with the figures of Meade and Grant visible in the foreground. The Lacy House—Ellwood—is visible in the background. This is where Fifth Corps commander Gouverneur Warren had his headquarters, and where Stonewall Jackson’s arm, amputated a year earlier, lay mouldering in the family cemetery. The house still stands and is open to the public, with a recreation of Warren’s headquarters in the front room. Another room has a large painting of Meade and Grant riding up to Ellwood to meet with Warren. The third sketch (above) shows the “narrow escape of Genl. Meade,” which took place on Myer’s Hill near Spotsylvania, on May 14, 1864. The Union and Confederate armies had bloodied themselves terribly on May 12 and on the 14th Meade rode forward to observe the Union lines. He and the VI Corps’ Horatio Wright were talking in the Myer farmhouse when, as I write in Searching for Meade, “the rattle of muskets and the thud of bullets striking the building delivered unwelcome news: the Confederates were attacking. Meade had to move fast. He jumped on his horse and, guided by Capt. Nathaniel Michler, a topographical engineer with some knowledge of the terrain, hastily made his way back toward the Ni River. A Confederate major galloped over to intercept him and even grabbed Meade’s bridle before his headquarters guard intervened and captured the rebel. The only thing Meade lost, other than his dignity, was his glasses.” I can’t imagine Waud witnessed any of this first-hand; more likely he drew this after hearing reports from others. 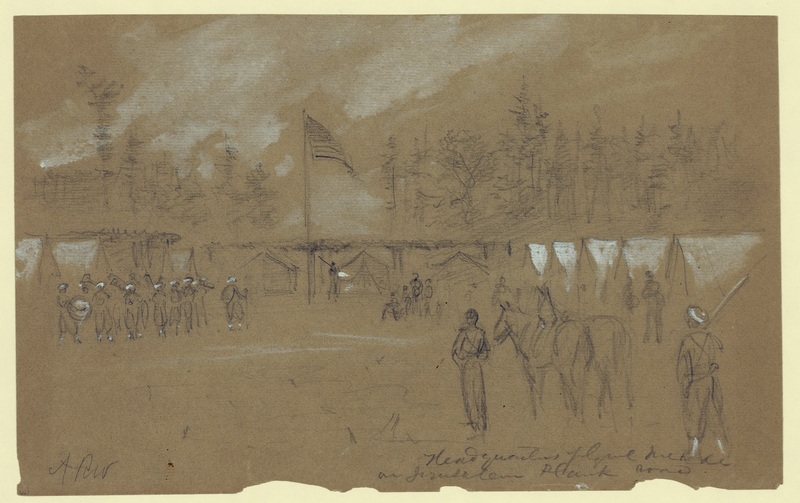 The final sketch here (above) is Waud’s depiction of Meade’s headquarters near the Jerusalem Plank Road outside Petersburg. The soldiers with the white coverings on their heads and lower legs are members of the 114th Pennsylvania (Collis’s Zouaves), the brightly garbed regiment that served as Meade’s headquarters guard. After the war Waud continued to work as an illustrator and he died of a heart attack in Georgia in 1891. 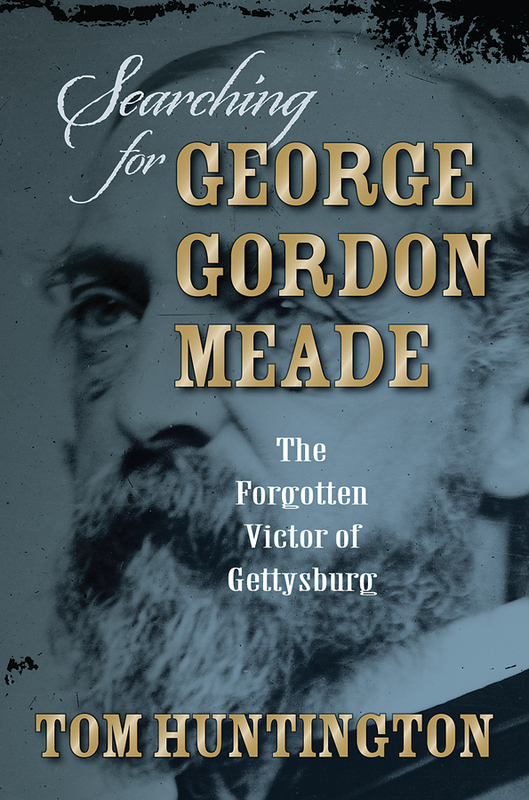 Searching for George Gordon Meade continues to make its way through the editing process, on track for publication in February 2013. We have just reached an important milestone along that course by completing the book’s cover. It was designed by Wendy Reynolds of Stackpole Books’ Creative Services Department and it looks pretty darned good, if you ask me. And the book is now available for pre-order through Amazon.com. Why wait? The other day I got to hold William Quantrill’s Colt revolver. I was at the National Civil War Museum in Harrisburg, Pennsylvania, with Kyle Weaver, my editor at Stackpole Books. The museum’s new CEO, Wayne Motts, took us into the museum’s storage facility to show us the artifacts there. He was pointing out all sorts of cool stuff when he opened an old wooden box. The Colt was nestled inside its velvet confines. “Look at this,” Wayne said, and he pulled out an envelope tucked into a side pocket. Inside was a letter from the Colt company, verifying that this Colt was the gun purchased by Quantrill. Apparently the notorious rebel guerilla had dropped it when he and his band were sacking Lawrence, Kansas, in August 1863 and a young resident dashed out from hiding to pluck it from the dusty street. Wayne had me pull on a pair of cotton gloves and he let me hold the gun. Now, I’m no fan of William Quantrill, who I consider to be a genuine bad guy, but I do like close encounters with history. The National Civil War Musuem in Harrisburg. 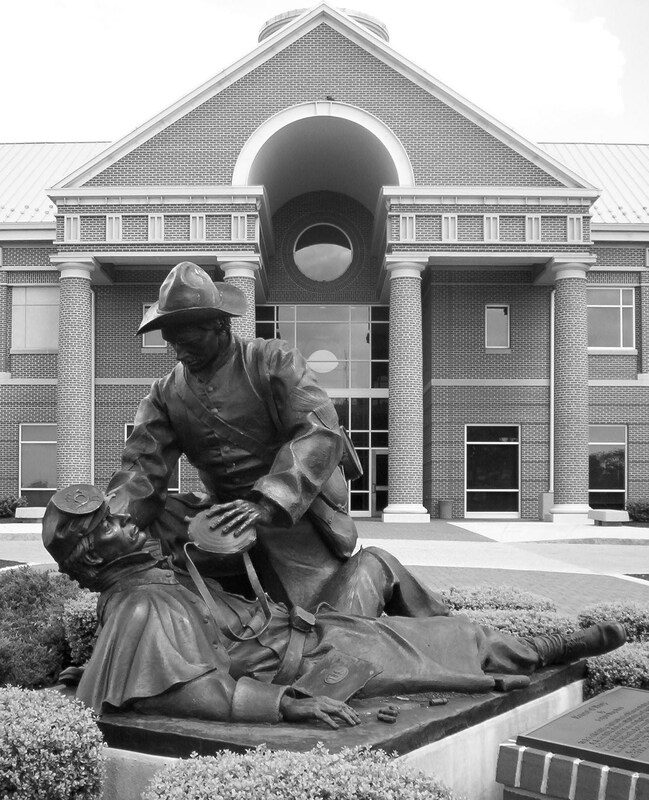 I also wrote about the National Civil War Museum in Pennsylvania Civil War Trails. It’s a beautiful institution with a fabulous collection. For the book I interviewed Harrisburg’s then-mayor, Stephen Reed, who had founded the museum, using city funds to buy a huge collection of artifacts. The museum opened in February 2001. Now, with Harrisburg teetering on the edge of bankruptcy, some people look askance at Reed’s brainchild. (He also bought up a lot of Western artifacts for a planned museum of the west, but that was one museum too many and it never advanced beyond some initial planning. Some of the artifacts have been auctioned off and more will be at some point in the future.) Because of the museum’s origins, the National Civil War Museum gets buffeted about my local and state politics (and current economics) but that doesn’t change the fact that it’s well worth visiting. Wayne is a man of seemingly inexhaustible energy and enthusiasm so I was very pleased to hear about his appointment to the museum’s top job. I hope Wayne can raise its public profile. In fact, we talked about some things the museum could do for Searching for Meade once the book comes out in February. Once those plans firm up I’ll announce them on this blog.